Hello~ I am Andy, a host of English Cafe in Busan, the best city in Korea. 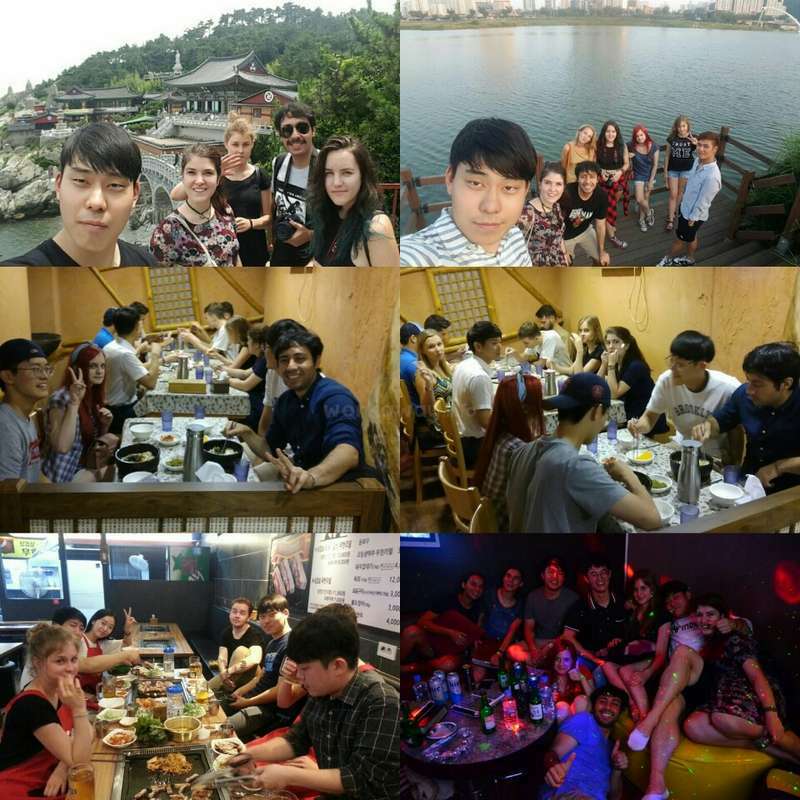 I started this project for foreign travellers to meet Korean friends and learn Korean language and culture, and also for Korean English learners to meet foreign friends and share experiences and ideas with them. 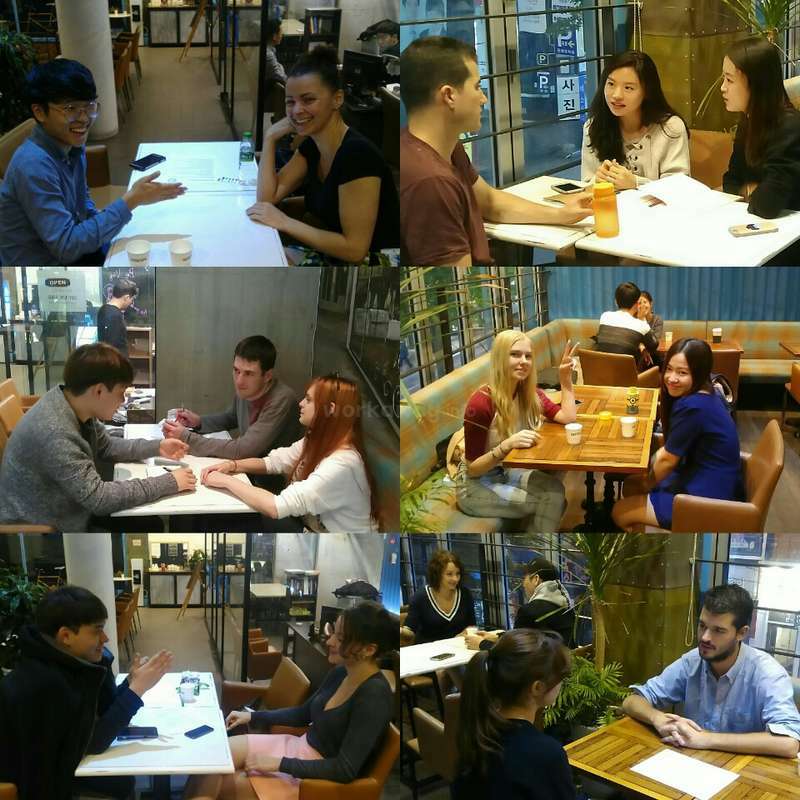 Our community provides warm and lively space for Korean students and volunteers to interact at our cafe. They meet and talk in English about a variety of topics, cultures and experiences. Foreign community members can make Korean friends, learn Korean language, and experience Korean cultures. They can also share their experiences and informations with other community members from all of the world. There are about 20 foreign community members from different countries at the same time. We provide volunteers with regular Korean class and occasional indoor/outdoor activities. Volunteers can meet many Korean friends at our community and learn Korean cultures from them. Volunteers can share travel information with other volunteers and can travel Busan and other cities in Korea together. We also have a tradition of going out in the PNU area after class so that volunteers and students can enjoy more interaction over a meal and drinks. @ Love meeting new friends and interacting with them. 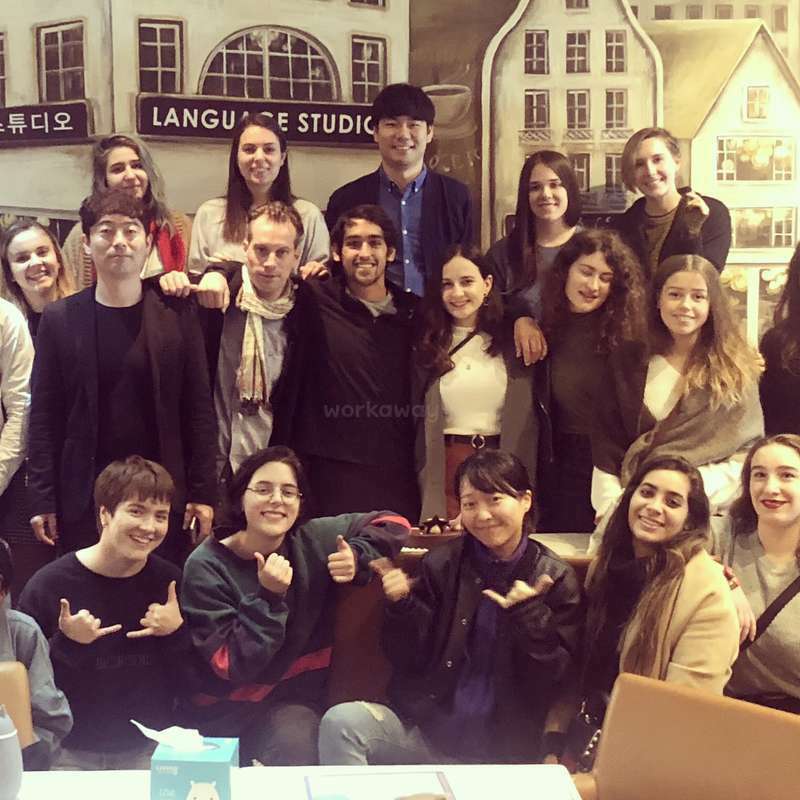 We aim to provide a friendly environment in which people from other countries meet Korean friends to share ideas, culture, experience and language. The cafe atmosphere is laid-back and informal as volunteers are not expected to prepare any teaching materials or formal lesson. They help Korean students improve their English with rather moderate conversation. While you are talking with Korean friends, you can help them improve their English with correcting their errors or pronunciation, suggesting good expressions, teaching vocabulary or grammar, and so on. A bunk bed in the shared room is provided for each volunteers at our dormitory-style share house. Full of fun things in the University area. Many tourist places in Busan. Volunteers and Korean students hang out and have a tour together. Couldn’t recommend this more. The work is exactly as advertised and very easy; combine this with the excellent staff and volunteers there made my stay thoroughly enjoyable. I had a really great time in this workaway and enjoyed so much my time in nearly 3 month workaway.I made many good friends and great memories.I recommend this workaway to discover Busan which is a wonderful city.Many thanks to Andy for being such a wonderful guy and manager and all the language cafe team. I spent 6 weeks there and I had such a great time with volunteers and students. It was difficult to leave such good friends that I met in Busan even if I'm still in touch with them. You can… read more do so many activities with students after or before your shifts like hiking for example. Brian and Andy, I'll definitely come to see you next time when I'll visit Busan. Joining the team was, without a doubt, one of the best decisions to make for my time in South Korea! I stayed there for almost 3 months and still felt like it wasn’t enough. BUSAN is a beautiful city and the area where the café is located (right next to the Pusan National University) is great and all kinds of shops, delicious restaurants and… read more street food, karaoke places and bars are just around the corner. While I was staying in Busan there were also LANGUAGE CLASSES held in the café for all volunteers who wanted to learn Korean (beginners and intermediate) but of course this might vary, depending on the number of students motivated to study this language. OUR HOSTS Andy and Bryan were absolutely great. While Bryan is more in charge of the café, Andy is the one to turn to with everything that has to do with your life in the dormitory or general “volunteer things”. He is one of the kindest persons I’ve ever met and always willing to provide help (even if it’s for finding a birthday cake or getting documents for your visa). There is also a house manager who is absolutely adorable and can help you if Andy isn’t around. If you are looking for a place to meet a lot of great and interesting people and really learn about Korean culture, this place is the right one for you. It’s a great place for people who are already interested in Korea or who are simply open to experiencing the country. Also living with all the other volunteers is a lot of fun, the area is great and I would go volunteering here any time again. I volunteered at the language cafe for 4 weeks last November and it was a once in a lifetime experience. Thanks to the nature of the work I was able to meet lots of Koreans, which is actually quite hard as it's very easy to just spend time with other travelers and workawayers. The actual work itself definitely forced me out of my comfort zone, as… read more I am more introverted as a person, but I ended up having some really interesting conversations and experiences in the process. Overall, I was made very welcome and will never forget my month spent in Busan. Riccardo stayed at our communiyt from January 6th to 31st. He is experienced and intelligent volunteer. He helped Korean English learners improve their English here. At the same time, he shared many different kind of ideas and Italian cultures with them. He loves animals, and he is vegan. He has strong belief in his diet. He also taught his native… read more language, Italian, to students who wanted to study Italian. He also taught yoga to other volunteers. 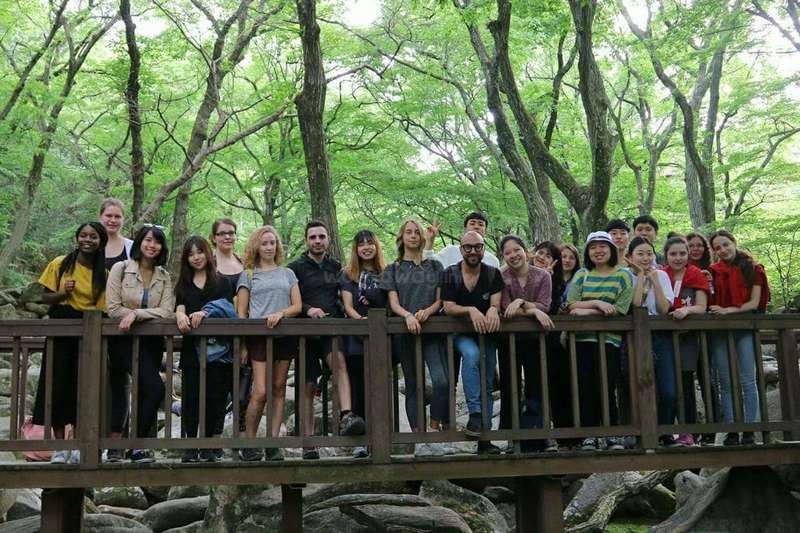 This was a very good workaway exchange in South Korea! Andy and Bryan make things easy for the job (3 conversation sessions of 70' a day/ 6days a week, with one to three people). It's quite a good occation to get to meet lots of people (local & international!). So the work isn't hard and you get lots of free time. Also with other workawayers it's… read more possible to change shifts if needed. I've been asked to do some Italian tutoring to a young Korean guy who is learning to sing opera and for me was a good experience. Overall, I enjoyed my time there. I thought the work was fair, and it's very easy to meet other travelers, get to see Busan: I made some good friends at the café. My only issue was with the living situation, at the time I was there the house was quite busy and the dormitory full, there is no much privacy, and on weekends tend to get noisy; but I've asked Andy to change room and he was helpful right away, so I can't complain at all. Finally they provide you with basic food: cooking and hanging up at the last floor where the kitchen is, has been quite cool, I even got some romance. Andy was super and really sweet, my roomates great and speaking English… read more with lovely Korean people great! You get to learn so much about the culture, eat great food and experience the beautiful city that is Busan. I loved the house and although it was my first time staying with so many people it was very nice and cosy-a very homey place! Food and drink costs are very reasonable so you don't feel limited, and transportation is very convenient and frequent. I really love it there and wish it was for more! Thank you all!!!! It has been about two weeks since I left Busan and I already miss it so much. It was my first workaway and I was nervous going into it as I was new to travelling but this place made me feel right at home. It’s amazing for first time travellers. The cafe is a great place to work at. I had so much fun with everyone. It’s an amazing place to meet… read more new people and to make new friends. And lots of opportunities to meet up with people outside of the cafe. The location is great and very close to the train station so getting around the city is easy. It’s also very social here so you will always have people to hang out with. The dormitory feels so much like a home and I miss it and the people so much. I completely recommend this workaway and I would love to return if I have the opportunity. Thank you so much Andy and Brian. I had and amazing time! Thalia is a very easy going and social girl. At our community, she helped Korean English learners improve their English. She talked with them in English about many different topics. While talking, she corrected their mistakes, suggested more natural expression, and taught them some necessary grammar points. I think she can be easily adaptable to… read more any environments and any kinds of jobs or tasks. Wooow I have had the best time of my life here in Busan because of this workaway. I spent one month here and I can easily say it was the best month i've ever had. I miss it so much already and I know without a doubt I will come back as soon as I can. Staying in the dormitory with so many different people really made this experience so brilliant.… read more If you're the type, you will spend your time in Busan going out in the evenings pretty much every day. Also the students you will be 'teaching' are so motivated to learn and become close friends to you, regularly we all hung out with them after class going for meals and nights out etc. The feel of the language cafe itself is so casual and informal, you just chat to them one on one for 70 minutes each. The area is lovely also, everything you need is closeby. There is a lot to do in your downtime - such as drinks at Basement & TP, shopping, board game cafes, restaurants and cafes, karaoke etc. Thank you so so much Andy and Bryan for this experience, I can't thank you enough! I recommend this Workaway to everyone who wants to have the most craziest time ever (also you must stay ATLEAST one month, everyone I met stayed longer or extended once they were there) I have made so many friends for life from this, see you guys again! The first and worst experience of irresponsible volunteers. Hellie and Marissa were supposed to work at 6:00pm on the schedule. They sent us a message 15 minutes before their schedule. "Hey Hellie and I decided to leave last minute due to some personal reasons. Sorry for the late notice. From Marissa"
I worried what happened and went to the… read more dormitory immediately right after getting this message to talk with them. But I heard they were already gone an hour ago from their room mate. At the same time, another volunteer was looking for her watch. I was afraid if they took it and I had to call police. Fortunately, the watch was found. I asked them to come back to talk, and Marrisa said Hellie has a serious family issue so cannot work and she should take care of Hellie. That's why they had left without any eralier excuses right before their working schedule. Still I do not understand their excusses and do not trust them. Some volunteers had family issue and then I never gave them work schedule. I just let them take a rest and leave early if they wanted. This case, however, I cannot understand their behaviors at all. They are so selfish and irresponsible. I guess they do not respect Workaway hosts and do not appreciate what their hosts offer. I worried what happened and went to the… read more dormitory immediately right after getting this message to talk with them. But I heard from their room mate they were already gone an hour ago. At the same time, another volunteer was looking for her watch. I was afraid if they took it and I had to call police. Fortunately, the watch was found. I asked them to come back to talk, and Marrisa said that Hellie has a serious family issue so she cannot work, and she should take care of Hellie. That's why she had left with Hellie without any eralier excuses right before their working schedule. Still I do not understand their excuses and do not trust them. Some old volunteers had family issue and then I never gave them work schedule. I just let them take a rest and leave early if they wanted. This case, however, I cannot understand their behaviors at all. They are so selfish and irresponsible. I guess they do not respect Workaway hosts and do not appreciate what their hosts offer. This was an excellent first workaway to experience! A lovely little language cafe with a cozy atmosphere nestled in a bustling university district, you'll have ample chances to meet dozens of new faces. I volunteered with Andy and Bryan (who are both awesome and easy to work with) for three weeks, and even on my last day at the cafe I was… read more meeting new people! Admittedly, for my first workaway I was looking for "work" that was easy to grasp and just as easy to do, and I definitely found it. There's no lessons that you have to prepare or anything of that sort, just a nice relaxing hour or so of casual chat with Koreans, many of whom have enough of a grasp on the English language to enable some very entertaining and varied discussions. Sometimes you'll have the same person more than once, and in those cases you really get to know who they are and can even form friendships. Speaking of friendships, there's about 20-30 other volunteers all living with you in a hostel or guesthouse type setup and you're bound to make some friends. You'll meet so many people from all around the world that at first it might seem hectic or intimidating, but if you're a social and outgoing person you'll get the hang of it really quickly. With so many different personalities, there's always something different going on. If you like to drink and party, there's plenty of people who will join you at a bar or club. If you want to go on a hike, there's probably a group planning to hit the same trail you are! Not to mention all of Busan's popular destinations are probably on people's to-do list anyway, so if you want you can always find some company. There's a convenient group-wide messenger so it's easy to ask about plans or just make new ones on the fly. As some other reviews have said, depending on who you are the living space might not be the best. It's busy, and with so many people it can get messy. There are two cleaning days, which helps, but if you're someone who has to live in a spotless environment it might not be for you. Another problem due to the population is the noise, everyone has a different schedule and while there are "quiet hours" past midnight, if you're a light sleeper you might be bothered by people moving in and out of the dorm. I'm a pretty heavy sleeper though, so luckily didn't face many issues in that regard. If nothing else, bring some earplugs. Food-wise, you get your basics in the kitchen. If you want something more, there's a nice little market literally next door with fruits, veggies, meats of all kind, any spreads you want for the toast, etc. There's also restaurants EVERYWHERE, and dining out is super cheap compared to some other countries. Even better, many volunteers and even students at the cafe commonly dine out after a session, so you can easily find people to eat with. The university area that you'll be staying in has all your shopping and food needs, but you also get convenient access to pretty much every bus line and you have a metro stop just a short walk away from the dorm. Busan's public transport is awesome, and between the bus and subway you can get pretty much anywhere in the city very easily. I highly recommend a transport card at a convenience store when you arrive. If you travel to other parts of the city often (which you should!) it will pay for itself and make it super simple to get on and off the bus/metro. So what else can I say? I loved my time here, and my only regret is not staying longer! Big thanks to Andy, Bryan, and all the friends I met at both the dorm and cafe. If I'm ever in South Korea again, I might just volunteer here again. All in all, I highly recommend this workaway for anyone who wants to experience Korean culture, meet new people, and have a hell of a time in the great city of Busan! We spent 2 and a half weeks at the cafe in April 2018. The work itself is good fun, 3x70 minute 1-on-1 (sometimes 2-on-1) sessions 6 days a week. We made some awesome friends among the students and other volunteers and learnt tons about Korea. Bryan and Andy are great guys, very flexible and easy to work with. The volunteer often has to take the… read more initiative to drive the conversation, so it can be quite tiring, especially if you get 2 students simultaneously who have different levels of English, but on the whole a very worthwhile and enriching experience. If we were only judging the cafe we would give it 4 or 5 stars. The living conditions were not quite our thing though. Very noisy as there is no separate common room, and you can hear everything that goes on in all the rooms. Many people are up until the early hours most nights as work never starts before 1325 so be prepared to readjust your body clock. The place was also often pretty messy, even though there are 2 cleaning days a week. So if you don’t mind that kind of environment then go for it! You’ll have an awesome time. If you have more sensitive sleep patterns and like your own space maybe don’t commit for too long till you’ve tried it. Busan itself is great, entertainment of the big city, but also some awesome beaches and mountains to escape to if you need, some great hikes right next to the Uni! Okay let me start by saying, this place is Fantastic!! This was my first work away, and I knew straightaway that I made an excellent decision! I spent 6 weeks here initially, but after a 3 week break I came back here for another month since I enjoyed it so much! Andy and Brian are both very kind and helpful, and are always quick on hand to help… read more you out with any issues. Volunteering here is nothing difficult, you are basically speaking English to Koreans 4hrs a day, 6x a Week. You can speak about whatever you like within reason, and you have topic books at hand incase you have a difficult student. For me the work was the best part of my time here since I thoroughly enjoyed getting to know people from completely different backgrounds to mine, and I made some excellent friends with the students whom I shall remain in contact with for a very long time! The living conditions probably won't be as good as your home, in fact far from it... but for a bag packer it's perfectly ideal. There is roughly 6 beds to a room, moderately comfy but the rooms tend to get very messy.. thankfully there are 2 cleaning days a week to prevent it turning into a tip! There are Hot showers, washing machines, drinking water, Kitchen, e.t.c with basic food supplies including; rice, ramen and bread. At first it may be a bit shocking meeting so many new people at once, since there are roughly 25 volunteers at any one time, but you will quickly fall into the family atmosphere they have there. The cafe and accommodation are both located in the Pusan National University area of Busan. This area is unfortunately at least 30mins from any of the big attractions Busan has to offer. However you will shortly come to notice that everything you require is in this PNU area. There are many supermarkets, cafes, bars, clothes stores e.t.c all of which are considerably cheap since it's a student area. Public transportation to other parts of the city is both very cheap and convenient so that makes travelling a little further more bearable. I highly recommend this place to anyone wishing to get an insight into the Korean culture and wanting to make great friends for life! P.S Prepare your liver, since many of the volunteers like to party several times a week! I volunteered at the Cafe for about one month. Everyone was so cool and welcoming. I met so many amazing people and made a lot of friends in such a short time. The tasks didn’t even feel like work most of the time! I wish I got to see more of the city but that’s because I was enjoying just hanging out with the other volunteers and students in the… read more house and cafe that by the time I started exploring it was time to go! Thanks Andy and Brian for the opportunity. See you soon! Volunteering in the Language Cafe was one of the best experiences of my life. Even now I wish I had planned to stay longer when I originally organised my trip. The atmosphere is so fun and welcoming and even though it was my first time so far away I felt very safe. Andy and Brian are such cool, interesting characters and they both make you feel at… read more home so quickly. I have no complaints at all about accommodation and the volunteering was highly enjoyable. It was a wonderful way to share culture and learn about the area of Busan, which is a very fun, laid back place. I think the concept of a language exchange cafe was a great idea and a wonderfully unique experience. I feel very lucky to have stumbled across it and all of the awesome people I met there. Thank you for this experience! Onur was a great workawayer. Super positive,hard working,out going guy. He spend 6 weeks with us in our Language Cafe and he was always nice to others.His teaching skills was extraordinary.He has been in many countries and he is well experiened person. He did great job and we would like to see him in our Language Cafe anytime. This was my first Workaway experience; I stayed at this Workaway for 2 months and I had the most amazing time. It was my second time in Korea and the experience really lived up to my expectations and made me fall in love with Korea even more. The experience itself was a great way to learn more about different countries and their cultures from… read more other volunteers, and to learn about Korean culture as well. It is very easy to become friends with students and volunteers, so we spend a lot of time together outside of the cafe, enjoying everything that Korea has to offer! There is always something going on or plans being made, so you will never find yourself bored or looking for something fun to do! There is also Korean classes on offer which was really cool, and meant I had a chance to learn some more Korean, and I was able to learn from some students too! Andy and Bryan were a pleasure to work with and made me feel comfortable from the start. Communication with the both of them was easy before my arrival and during my stay. The work itself is fairly simple - you work one shift a day (Afternoon [1.30pm -5.30pm] or Evening [6pm- 10pm]) during the week, which is 4 hours long and is split into 3x 70-minute conversations and 2x 15-minute breaks. The work is simply talking English with Korean students and helping them when they need it. It's very relaxed, and there are no strict rules or guidelines to what we speak about. I had conversations about most things related to culture, food, language, music, film etc. Volunteers also work one afternoon shift on the weekend and have one day free to do as they please. The accommodation was fairly basic but had everything that I felt I needed. 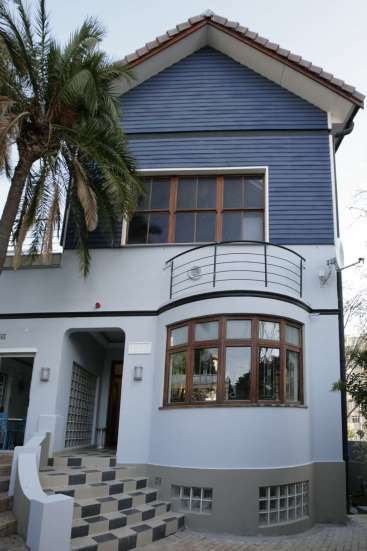 The house itself is split over 2 floors and is shared between 20-30 people, with rooms ranging in size. We sleep on bunk beds and share a lot of space together so if you are someone who isn't comfortable with that, that's something to consider before coming here. When I arrived I was a little thrown off by the number of people but got used to it and settled really quickly; as you start to get to know people it becomes a lot easier. The house is shared by a lot of people so isn't always the cleanest, but it is our responsibility to keep it tidy so if you clean after yourself it normally stays at an ok level. The location of the Workaway is perfect, as it is in a university area, so there is a lot to do, cheap places to eat and shop, and a young vibe around the area itself due to the huge number of students at the university. It is also easy to get to the other main areas of Busan by subway, and the accommodation is about 7mins from the subway station. I would 100% recommend to anyone who is considering coming here! Thanks Andy and Bryan for the amazing experience; I'm missing Busan greatly right now! Actually my very first workaway on my very first trip abroad alone. there are around 20-30 volunteers at any given time which sounds crazy I know, but what it’s actaully like, is a youth hostel with regular dorms and people you… read more not only get close with but live with for a minimum of 2 weeks. As a result I got to meet and spend time with all kinds of characters from all kind of countries and made some lifelong friends. 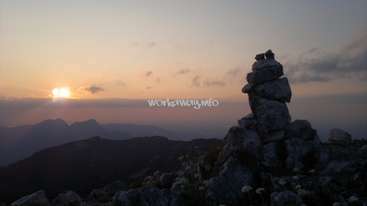 Unlike many other Workaways I was eyeing this workaway has a very enjoyeable work. You work for 4 hours a day in the evening or afternoon and meet lots of different korean folk, all of different ages who share the same passion, learning English. It is not teaching, you tlak to them as friends, if you like korean culture you can learn lots and also get tips and tricks about what to visit in Busan. This house is open to all ages ~ however when i was there everyone was under 31 wih the majority being in their early 20s. Finally (wow this was a long post) I want to thank Andy and Brian for hosting me and making my first workaway very easy and to organise and so much fun to be a part of, I will never forget it - Amazing. I volunteered at the cafe for a month and found that this workaway truly gives you the opportunity for a cultural exchange. This was my first time in South Korea but learned lots about the culture from the students who quickly become your friends! I loved that you can experience Busan and Korea from a more local perspective while also sharing… read more things from your own culture and country. The "work" is sometimes challenging but quite rewarding, and the students are always so grateful for helping them with their English. My favourite part of this workaway were the rich conversations and connections you can develop with the students. Busan is an easy-going city with mountains and beaches which were amazing to explore. The volunteers are all ages and from all over the world so you get to learn lots about other cultures as well. The living conditions are basic, but rice, bread, instant noodles, onions and kimchi are provided. A common room would have been great to have some privacy or to hang out without having to worry about disturbing other people. Andy and Brian are both great, funny and kind people who work hard to make the cafe a success. I was volunteering in an other guesthouse in busan but i saw in workaway this interesting project so i asked the host to come and volunteer with them , he invited me to join the team and practice english with korean students, it was really so nice experience and helped me to discover more the korean culture, thanks a lot and hope to see you soon… read more when i ll come back to south korea.. I had an amazing time volunteering here for 3 weeks. So many incredible people- students and other volunteers from around the world that I hope will be lifelong friends. Andy and Bryan were great hosts, I especially enjoyed working with Andy. He was a great communicator in the time before I arrived and during my stay there. I didn't find the… read more shift (6 days a week, 4 hours per shift, either afternoons or evenings) to be too much work. I found there was lots of free-time but I've been to Korea including Busan before so I didn't have much in the way of sightseeing plans anyway. I enjoyed living like a local and spending time with friends from the cafe and house. Living conditions were concerning. Recently they moved from one location to another and I think this transition resulted in some issues that they are still ironing out. There was constant water leaking in my room and on my stuff, and heating consistency in the room was very poor. There were around 20 people on our floor sharing 2 showers (but only one was working most of the time), the laundry machine was also leaking and there was no common area. Sleeping with so many different people coming and going at all hours of the night was very difficult, especially without a common area for people to congregate instead of bedrooms. The front door to the second floor of the house (where I stayed) also did not lock and no attempts were made to fix it in the 3 weeks I stayed there. I brought it up several times to staff. I would definitely be interested in doing this Workaway program again. It was an incredible opportunity to meet other travelers and the students. I learned so much from the students and truly appreciated getting to know them. I am sure the living conditions will be addressed as they settle into the new place and receive more feedback from other workawayers. Again, the hosts were also amazing- Thank you, Andy and Bryan, for this opportunity! I really recommend this place and wish you a great time in this café! I stayed with the café for around three weeks. The working hours are split into two shifts, so you either work the afternoon shift (13.30-17.30) or evening shift (18.00-22.00). You will have to work 6 days a week unless you are willing to do double shifts. The work is mostly fun, you'll get to know lots of people and sometimes it just feels… read more like chatting with friends rather than teaching. However, because of the working schedule there isn't really much time to do sight seeing especially if you want to travel somewhere outside of Busan - you will need to do double shifts to get two days off. We volunteered here for 3 weeks over Jan/Feb and it was really a lot of fun. The language cafe is super well organised, the shifts are either 1.30pm-5.30pm or 6pm-10pm randomly organised into a timetable by Andy; and you work 6 days a week. The shifts are broken up into 70 minute sessions and you get a 15 minute break in between each one. The… read more students rotate each session so that you speak to someone different in each one. The students come from all walks of life and can be any age which makes getting to know the culture from them so interesting. Making friends with them and going out with them for day trips or food in the night was really amazing. The only downfall to the cafe was that you have to work 6 days (unless you do a double one day to get the weekend off) - this is too much because you don’t get so much time to actually sightsee. The accommodation wasn’t so well organised in comparison to the cafe. We all lived in one big apartment block spread over two floors. Downstairs had 3 dorm rooms (about 20 people), 2 shower rooms and 2 toilets. Upstairs had 2 dorm rooms (about 8 people), one shower & toilet room and one kitchen. Every Monday the volunteers clean the house at 12pm although the house was never clean, in fact it’s the complete opposite. The living conditions are quite difficult because we didn’t have a common area so it was always quite noisy in the dorms. Different people had different sleeping patterns and drinking patterns so you have to be able to either adapt to or just deal with the noise. The showers were never hot, just luke warm, because so many people were using them at the same time; and Korea was between -10 to 3°C at the time. Living there for 3 weeks was a lot of fun though and we made some lifelong friends, we would definitely recommend it as a unique experience. Andy & Bryan are absolute legends, so welcoming, kind and accommodating. They both have an awesome sense of humour and will try their best to give you what you need whether in the house or language cafe. We would definitely go back to the cafe if we’re ever in Korea again!! This palce was our first workaway experience and we couldn't be happier! We stayed there for three months and due to our job at the cafe we got to meet a lot of friendly and kind locals who have become our friends :) This is definately the best way to know about the korean culture from the inside! And also the "job" doesn't really feel like a job… read more as you only have to talk and listen to the students, so it's a really nice experience alltogether! Also the life in the guesthouse with the other volunteers is great!! You get to meet people from all over the world and everyone is so easy to get along with! Working at the Language Cafe was an amazing experience. This was my second workaway and honestly I was a little worried with the large number of volunteers, but that wasn’t an issue and I ended up staying for 6 months! As you can see from the comments, you’ll meet so many amazing people, from the volunteers to the locals, who you’ll have long… read more lasting friendships and experiences with. Speaking of the locals, the students are all very kind and generous. You’ll certainly learn plenty about Korean culture from them, and through working and living there, plenty about yourself. Lastly, the place is managed extraordinarily well (thanks Andy and Bryan for everything! ), plus Andy provides excellent directions from wherever you’re coming from. I would highly recommend this to anyone as it’s a great way to meet and interact with people from the locals to the various volunteers from around the world. Truly an unforgettable experience. It was an amazing experience. Looking at all the great reviews, I was skeptical of how true they were but it truly is a 5 star experience. 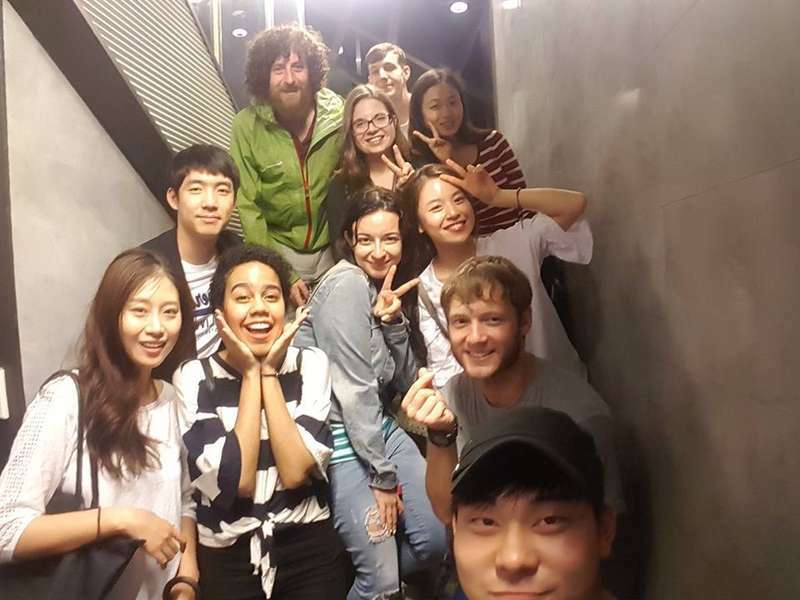 There are so many reasons why this is an awesome choice: you have so many opportunities to make friends with volunteers because you spend so much time together as well as the Korean students (which btw are… read more sweet and fun). You will learn a lot about the culture, try lots of foods, and party like you're in college. Also, the hosts Andy and Bryan will help you with everything you need. I would recommend this to anyone that wants to meet new people and explore a new country. I really appreciate what he has done at our community. Brandon is very kind, freindly, and considerate. He has great positive energy and can socialize very well with easygoing and outgoing manner. All people here liked to talk and hangout with him. He is also smart, neat and organized.… read more He was truly responsible at his duty and willing to help any kind of work at our community. His works here were helping Korean students improve their English and maintaining and cleaning our accomodation. He always showed great influence and result. Students were very happy with him as they could learn a lot from him. Other volunteers also enjoyed working and staying with him. He is more than welcome to come back at anytime. Andy and Brian work well together to create a hands-off, yet comfortable, cultural experience for all volunteers. I found that I gained deep cultural insights from the conversations I had at the language cafe. You get the most out of your time there if you approach each and every interaction with genuine curiosity. If you want to learn about South… read more Korean culture while absorbing the young vibes of Busan, Andy's project is for you. This was my very first workaway and I am very happy that I went. Andy is very kind and the job is super easy. I felt very comfortable at the house. I had a blast with the students and with the other volunteers. Would definitely go again. Thank you Katie. It was so nice having you here with us. The students loved having you here and you are welcome to come back anytime. You were very kind, you helped clean and showed other volunteers around. Hope to see you again soon! Thank you so much Andy for letting me stay. It was my first workaway experience and I loved meeting all the Korean students and exchanging language and experiences. I highly recommend this for a fun experience in a great area. Pusan National University area has so much to offer. Thank you also for being a great host and for helping me and others… read more adjust and doing minor tasks like even helping us use the post office. It was a wonderful experience and I am glad I was able to be apart of the family. I had extraordinarily high expectations prior to coming here due to all the good reviews. 3 weeks later, I understood all the hype and dare I say, this workaway isn’t hyped nearly enough. Put 20 people from every corner of the globe into one house and you’re in for some shenanigans (and maybe a botched liver lol). I think I met someone from every… read more walk of life in the short time that I was here. People truly do make the place. As for the shifts, be prepared to talk for extended periods of time. In my experience, conversations ranged from mainly yes or no questions to stories of military service (always interesting btw) to Schrödinger’s cat. Regardless of level, the students were all sweet and open-minded. And if you’re there long enough, you’ll probably form some lasting connections with the regular ones. It was my first workaway experience and i have no regrets. The volunteering job is quite easy and interesting. If you put some effort you can discover many untold things about korean society and their culture. After two months i fell in love with Busan and locals. What can i say. PNU area feels like home to me and the volunteers (id rather call… read more them my family) will stay in my heart forever. I wish i could stay there longer. How can I put my experience into words? I had one amazing time in Busan, and it's mainly thanks to this workaway experience! If you're hesitating to go, don't. 진짜! Andy and Bryan: They are amazing people. They've both been so nice to me... helping me out, taking me to… read more visit places, chatting in such friendly way, accepting to let me have an extra day off so I could go on a trip. This cafe is so well managed thanks to them. I've been to other language cafes in other countries and none were as good as this one. Even the share houses where the best I've been to because they make sure it stays clean and confortable. The cafe: it's a great place where I was happy to go everyday. I stayed there almost 3 months and not even once I though "I wish I could do something instead like visiting..." No! Because everyday I got to have fun and interesting conversations with koreans. And sharing opinions, life experiences, jokes etc. was 10 times more worth it. Most of the students at the cafe are actual university students. But you also get to meet high schoolers or older people. Which is so interesting because you get to share different things and end up learning even more about korean culture and about life in general. You'll be working 6 days a week, each day 3 times 70min (each session with different students, and with a 15 minute break in between), either in the afternoon or evening. And you will end up making really good friends. I hanged out every single day with some of the students, we even went to Seoul, and one will visit me in France next month. The share house: There are two of them. The one I was in was so good, pretty big, confortable and clean. My housemate became good friends as well. It's crazy how much I miss living there. You get free bread, rice, kimchi, potatoes, onions, carrots, instant noodles, soap, laundry powder which is very convenient. Because Andy truly care about the volonteers. Also it's extremely close to the cafe and in the university area full of young people, restaurants and things to do! Anyway you get it. This workaway is the best so just go already! Andy, I hope you are doing good! And say hi to Bryan for me. I miss the Family so much, you can't even imagine. I will be back, so wait for me! I have been at this Language Cafe for three months, from July to the end of September. It was by far one of the best travelling experiences that I have ever had. If I have to sum it in few words, I would use the quote "It is not about the place, but the people". In fact, the people were truly amazing. Starting from the managers (Andy and Bryan)… read more who are really kind and organized, to the other volunteers and the students. The cafe is in the PNU area, so it is full of things to do and new people to meet. As a volunteer, I was asked to talk to Korean students in English for three sessions of 70 minutes each. There are two shifts basically. You can work in the afternoon or in the evening (always three sessions). 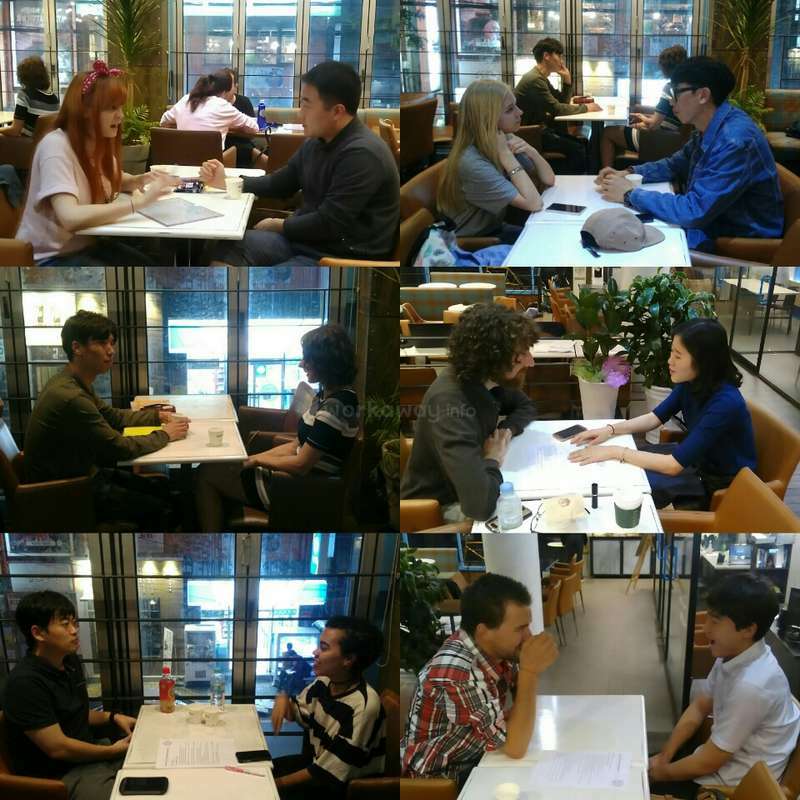 It is a great chance to meet locals and experience a real Korean life by befriending them. There is plenty of time to visit Busan during the day and get even further outside the city on the days off. I would really recommend this place because it is very well organized, which helps to keep everything enjoyable. It is a great chance to make a lot of new friends, get in touch with the local culture and grow as a person. Linda is active and energetic. I really enjoyed talking and working with her. I appreciate everything she has done while satying with us. She is very passionate and responsible at work as well. She worked at our Language cafe for 3 weeks and her job was helping Korean English learners improve their English. She also shared her experiences and… read more cultures with Korean students. All Korean friends here liked to interact with her having great British accent and French background. The Cafe is located close to the main university so you won't be bored at night ;) and they are many nice places to go eat and discover Korean specialties. Andy is a great person and will always try his best to accommodate you and help you with any type of request :D like finding a new computer, buy a bus ticket. He is just great!!!! Fabrizio is a really good volunteer. I appreciate everything he has done while he was staying at our community. He helped me at our language and culture exchange cafe for almost 3 months. He was very friendly and easygoing with other volunteers. At the same time, he was very responsible, diligent, and sincere at work. He enthusiastically helped… read more many Korean friends improve their English for 3 months. Above all, he was willing to find any tasks which can make our community better and did it voluntarily. I had a really great time working at this English Cafe. Andy and Bryan are really great hosts, I was pleased to meet Andy, he is a kind person and he is willing to help you whenever you need to. Staying at the house was a great experience, I was able to meet people from different countries, now friends, volunteers and students. Busan is an… read more amazing city, staying there for one month and a half was truthfully one of the best experience of my life. Volunteering here was my first workaway experience and I'm so happy I decided to do so. I spent a month in this cafe and it was an amazing experience. Not only I got to meet a lot of local open minded people, which was the best way how to learn about Korean culture and the country on its own, but I also made so many friends around and had so much… read more fun with the fellow volunteers. The cafe is situated in the university area so there's plenty of interesting places to explore and opportunities to enjoy Busan's night life. The work was super easy, and Andy with Brian were always very helpful and easy to talk to. I will truly miss this place! I stayed at the cafe for two months and they were one of the best spent months of my life. Andy and Brian are very kind and helpful and they will do everything to help you if you need it. Also the volunteering here can be really interesting, since you have the opportunity to know lots of Korean people who will introduce you to their culture and… read more will show you around. It is also a great way to get to know plenty of other volunteers and have a lot of fun, being it in the university area which is great for drinking, eating and meeting new people. So if you’re considering going to Busan I recommend you to stay at this cafe, at least for a while! John is a responsible and sincere man. John stayed at our cafe for about a couple of weeks. He helped us a lot while he was staying with us. He was willing to help Korean studnets to improve their English with his a variety of experiences as a native speaker. He was easy-going and social with other volunteers and also Korean students outside of… read more cafe as well as in the cafe. I was happy to have him as a volunteer and will have him again anytime. I worked in the cafe for a couple of weeks. The cafe is very well run and I was really looked after by the 2 hosts, Andy and Bryan. This in an excellent way to get to know many Korean students and of course volunteers from all of the world. This makes it a very rich cultural exchange experience on many levels. 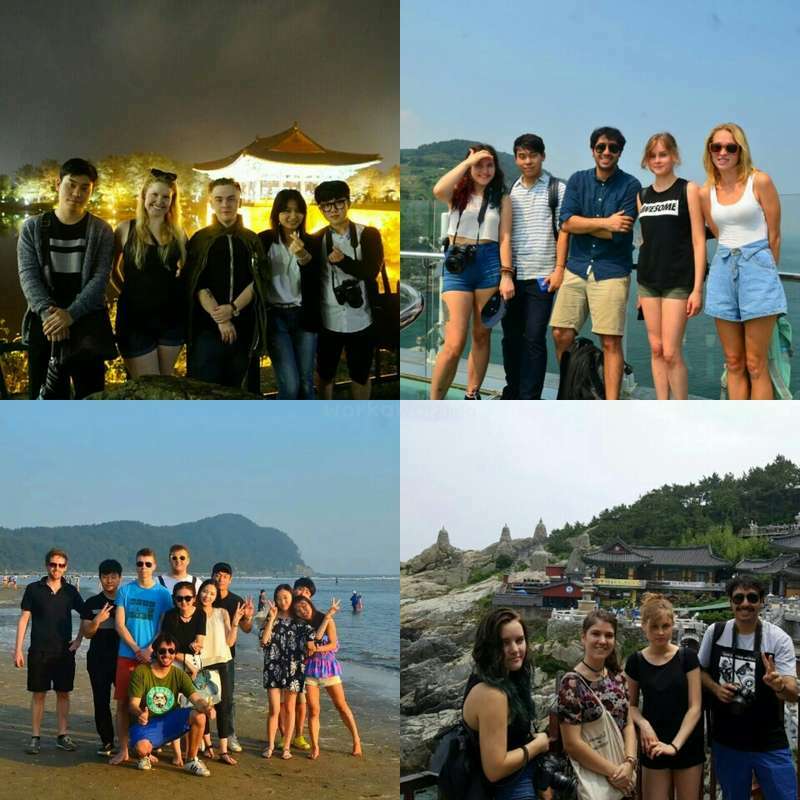 Getting to know the Korean students… read more will mean that you can explore Busan and other areas with local people, which believe me, is great in terms of food and entertainment. The house and accommodation is comfortable, friendly and in the centre of a university area so plenty of restaurants, bars, clubs and other entertainment! You will receive basic food such as rice, potatoes, vegetables, ramen, kimchi which helps for the food budget. I think to enjoy this experience you need to be sociable and able to hold good conversations with Korean students. You will live in a house with many volunteers, so you need to be adaptable to this and flexible to make the house run smoothly. Busan itself is great. Fresh coastal air, great beaches, a vibrant city with many local attractions and place to visit nearby. It is also only a few hours on the train to Seoul. Thank you so much for the amazing time! Andy is probably one of the bests hosts a traveler could imagine, he really cares about the volunteers and the cafe! He was always there for us, kind, fun and always has time for everyone! Plus he took us to see places and joined our fun! This cafe gives you the opportunity to make Korean friends and learn a… read more lot about Korean culture. Living in the volunteer house was also a looot of fun! Thanks for everything !!!! This was my first experience doing Workaway and it was AMAZING. I would recommend you to go to Andy's Host. You won't regret it. In the cafe I met a lot of Koreans and volunteers from different countries. You learn more than what you teach. You'll face and share different cultures and different points of view among them. People are so nice and… read more friendly. You will get to the point that you don't want to leave the house. You have plenty fo things in the house, bread, ramen, vegetables, kimchi, etc etc. And all the things you need to cook. It is also located in a good place, you can go to Haeundae or Gwangalli Beach, some temples, mountains, everything you can imagine. It's Busan the BEST city in Korea. This was my very first workaway and it was amazing! Andy is a great host and the language cafe is a really fun place. I'll never forget my time here and people I've met there. This experience was by far one of my best experiences abroad. I'll definitely come back! I had so much fun at this cafe! Working hours may seem a bit long at first, but once you get to know the students (which is really easy as they are very eager to learn English through conversation) time flies by! Students are very friendly and open-minded about travel and other cultures - I met completely different people yet got along with them… read more all just fine. Andy is an absolutely brilliant host who is constantly checking up on us to make sure everything is going smoothly. If someone needs help (e.g. hospital trips, bank problems, etc) he will always take the time to help the person out no matter how busy he is. It's very easy to have conversations with him as well and he has a great sense of humor. He also replaced a whole washing machine at our house just a few days after we mentioned it wasn't working so well. The volunteers I met were lovely and always up for a fun time. There were visits to the beaches, temples and such must-visit places around Busan. Though I didn't take part in all of them, the option was always open! Overall, I had a wonderful time during my stay and will miss everyone dearly. This was by far my best experience abroad last year. Running language practice with the students hardly felt like work and the Budae area is one of the best places in the country to experience Korea. All of my coworkers and housemates were awesome, too; we had regular K drama nights and frequented the omnipresent noraebangs and the local Thursday… read more Party with impunity. Andy was also very accommodating, and we had ample free time to check out the local lantern festivals, museums and such. DO THIS WORKAWAY. If I had infinite time I would go back every year! If you are considering on Workawaying here, don't second guess it!! Words can not express how glad I am I decided to volunteer here. It was my first Workaway experience, and I was quite nervous. But let me tell you this, from the very first day I knew I was going to have a great time. And boy did I!! You will… read more get the chance to meet so many incredible, nice, crazy people, and you will love them as family. It is such a great atmosphere at the cafe and the shared house too. Andy is a great person and he will make sure you are comfortable and well. Brian is the funniest boss I've ever had, and a great person too. As for the location and Korea itself, it is simply AMAIZING!!! The cafe is at a great location and everything is so accessible!! There are just so many things to do and see! For me, three months was no way near enough to see it all! I'm already looking forward to volunteering here again and can't wait to see everyone again and make new lifelong friends! If you do decide to stay here, I can assure you, you won't regret it!! So you will have a great time. You will be always busy, cause there is a lot of things to do in Busan, especially when you're not alone. More than the job in the cafe that is very nice (you talk in english to people, you can learn a lot about the culture), you will not see the time go. The staff, Andy and Bryan, will also go out with you, play Overwatch and answer all your questions. No way to get lost. And you will be able to have enough free time to travel out of Busan. I had a good time working at the language cafe. One can hardly call it work though (too easy and fun). Accomodation was also good, with lots to do in the area. Bryan and Andy, the two boss men, were terrifific. And all the other volunteers too. We spent 2 weeks working in the Language Cafe and loved it! Andy and Brian have created a unique atmosphere where people get together and share their cultures and stories. The Korean students are very willing learners and are extremely enthusiastic. We have many funny and happy memories of the cafe and all of the students. The city of Busan is an… read more incredible place to spend time. From the mountains to the beach, Busan has it all with the cafe and shared accommodation in the heart of the PNU area. Thank you again Andy and Brian! Jay is an easy-going, cheerful, and considerate girl. She is also very intellectual. 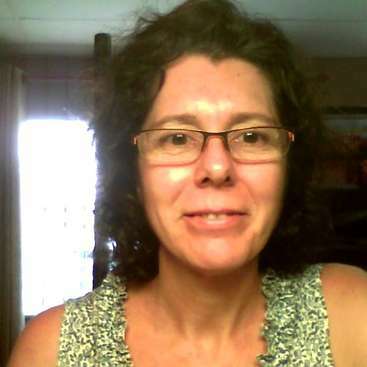 She helped Korean students very well to improve their English with a variety of knowledge and information. She was also wiiling to share her ideas and cultures with others. She actively interacted with our members in the cafe and also outside. If I coud describe my stay in one word, I would use : MAR.VE.LOUS ! 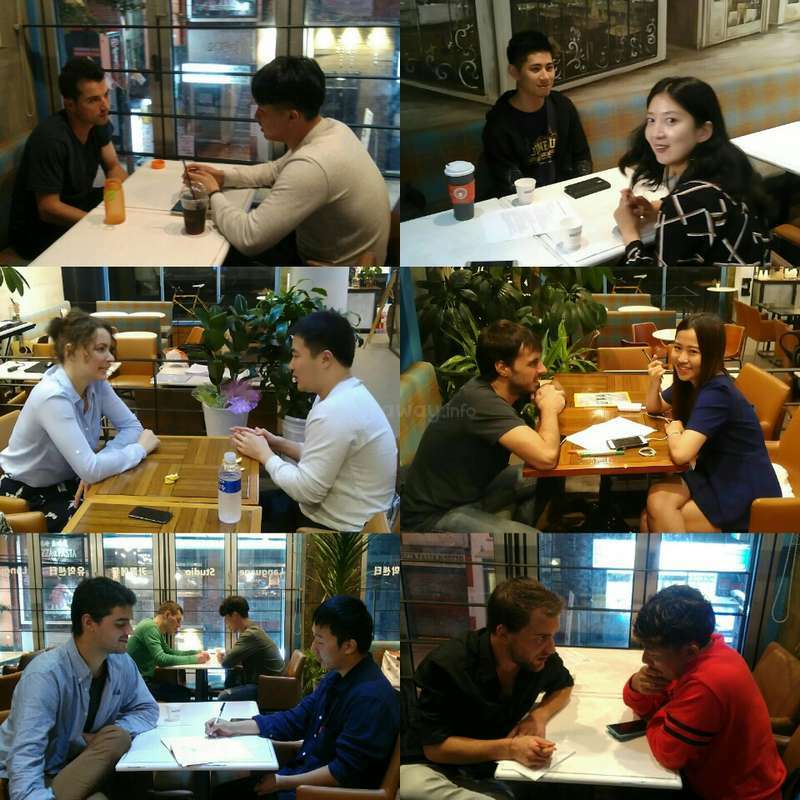 I have not enough english vocabulary to describe my experience at the Café, though I spoke english 4 hours a day to help student improve their level of english. The students are sweethearts, eagger to learn, with interesting stories about Korean life to share. I earned so much in… read more their contact. If you want to make great friends, learn a lot about korean culture and history, get a glimps of tradition, and speak english in the way, then the Language and Culture Café is your spot. I also hope you will still be able to give Korean lesson for volunteers, that is a brilliant idea. I have no words to describe this amazing experience! It was the first workaway I did and it could not have been any better. The day I arrived at the Café I was immediately introduced to the whole concept and all the introductions were explained very clearly. While 'working' in the Café it is very easy to make friends since talking to people is… read more the main purpose of the whole program. It's a lot of fun to meet so many different people (that being Koreans or other volunteers) and being able to learn about whatever the topic of the conversation is about. Of course on some days the work can be more draining than others (especially after a longer time of staying there) but generally I always enjoyed talking with the people attending the Café since a lot of them became friends very quickly. Andy made me feel very welcomed from the beginning until the end and during my almost 4 months of stay he became not only a person I could always depend on but also a close friend I am so grateful I was able to meet. He would always care a lot for us volunteers to feel comfortable and give advice or help us with anything we needed it for. He's an incredible man who I dearly respect, care and thank for for making my life in Busan the best possible. Generally I can say that I've had the best time there meeting great people and living in a family like community. The friendships and memories created in Busan did a lot to me (positively!!) and all of it was just made possible by attending the Café. I miss everything so much and I am already excited to come back! It was great to have Jana and Mattia at our community. They were always responible and sincere while staying at our place. They helped me a lot. They were really nice to Korean students in the cafe. They are willing to listen to them and talk their experiences and thoughts. They are calm, social and kind to other volunteers as well as Korean… read more students. They are also clean and neat in the house. 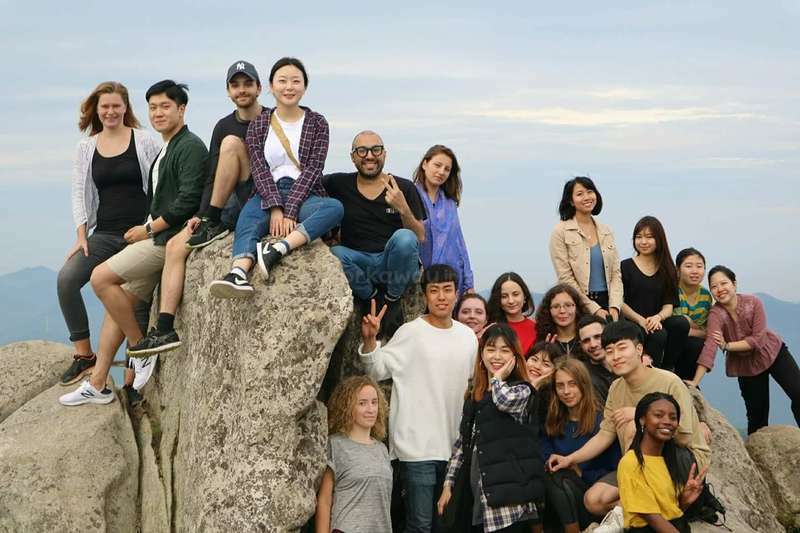 We spend 3 weeks in the city of Busan and the Language Studio with the guys running it is such a great place to meet new people and experience the real culture of beautiful South Korea. 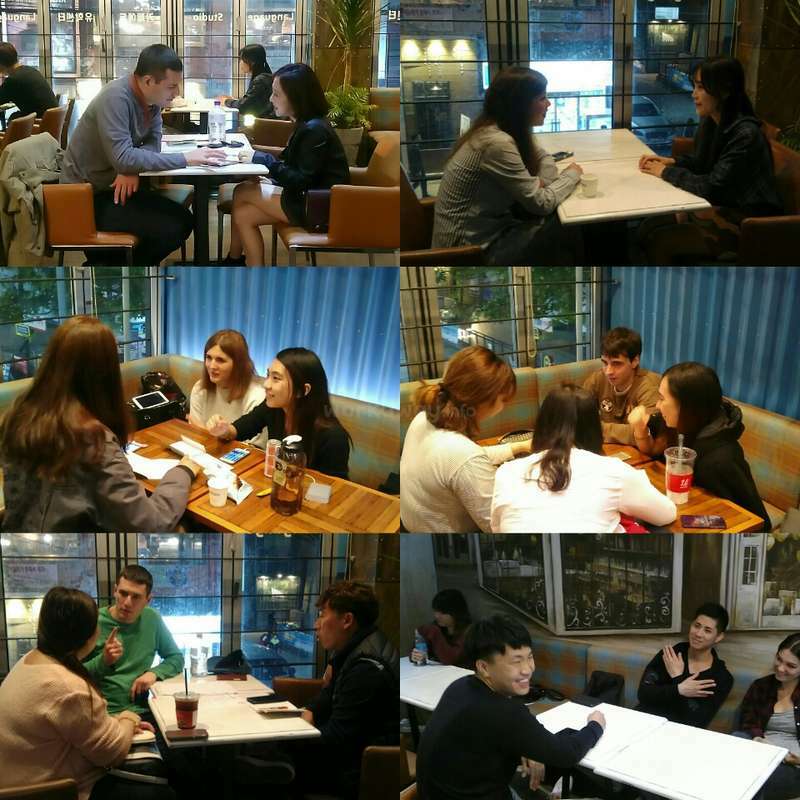 The students at the cafe are great fun too, and so eager to learn that work sessions fly by and you'll also get to learn something about Busan as well as exchange… read more your experience and teach the students some new phrases and expressions. Brian and Andy are putting a lot of themselves into this project, and it's so good to see enthusiastic people like them. Also it is a very great opportunity for everyone, both the workawayers and the Koran students. Thanks, guys. We've really enjoyed our time here and met some interesting people. The city has a lot to offer, historically and culturally. Everything from hiking trips to shopping, to lazy days on the beach, markets and amazing food. Hopefully we'll be back some day. Thanks again! I spent 5 weeks at the cafe in Busan and it was honestly one of the best trips I've ever taken. Andy is an amazing host, all the volunteers are amazing and you will literally never be bored. There is so much to do around the city - cultural, food, hiking, historical (and especially the greatest parties until the early hours of the morning). The… read more work is a really great experience to talk to some great and enthusiastic local students, and often we would meet them after cafe to hang out at the local pub, try some local street food or restaurants and head into the club or Jimjilbang (spa land!). 100% recommend, you will almost certainly extend your stay. Brent is the best volunteer at our cafe. Not only as a native speaker but also as a good teacher he was willing to help Korean students improve their English. He is gentle and patient with beginner English learners. He is also easy-going and considerate with other volunteers. Besides, he is very responsible at work. What better way to learn about the dynamic city of Busan and life in South Korea than through the eyes of the Korean students at this English Language Cafe. Brian and Andy run a great cultural and work exchange program where you will share many laughs and experiences while making lots of new friends. Busan, besides being famous for shopping and… read more cinema, has a lot to offer with its many markets, parks, friendly people and more mild climate. And if you like hiking, natural areas and spending time on the beach, there are heaps of options and many special places to discover within and around the city. Andy is a kind and considerate guy that will make you feel right at home at the volunteer house. This was hands down the best Workaway I have done. Better yet, it's one of the best life experiences I've had in my life. First the work, you have three 70 minute long sessions per working day, with 15 minute breaks in between. You talk to 1, 2, or rarely 3 people per session, depending on how busy it is. Depending on the person you're talking… read more to, 70 minutes can feel like 20 minutes, or it can feel like forever. The people at the cafe are very open to going out with you and showing you around Busan. I've made some really good friends that I go drinking, eating, and partying with. And there are many volunteers at this place with groups always going out to eat, drink, party, karaoke, sight see, and all that good stuff. You'll never be alone here if you don't want to be. Korea itself is modern. The subway and bus system are awesome, make sure you buy a T-money card for travel benefits. Be ready for the drinking culture in Korea. On a light week, you might drink 2-3 times, of course you can decline if you dont want to drink. This is a must place to volunteer if you're coming to Busan. I originally planned to stay for a month, but ended up staying for two and a half. This place grows on you. Good luck on your adventures and may you experience all the wonders of experience. I don't even know where to start, this was my first workaway experience, I stayed only for one month and 10 days, but I wanted to stay much more, I met so many different people, volunteers and students, all of them made me feel welcome from the first day, I learned a lot from them and had lots of fun too, this place is the best. The only problem… read more is that we have just one day off... Kkk... But if you organize yourself you'll have plenty of time to know the city... And it's worth it, Busan is the best place! As for the work, it's pretty simple, just sitting and talking to the students at the cafe, but it can be tiring sometimes whe you have beginners, so if you have teaching techniques it will be of help, you can you any tecnique you want, this is free for the volunteers. I hope you'll enjoy this place as much as I did! I don't even know where to begin or how to describe how amazing this place was. I spent three months in the cafe and i enjoyed every single bit of it. This was my first Workaway experience, as well as my first time living abroad so i was struggling in the beginning but Andy helped me a lot and made things much comfortable for me. I was supposed to… read more stay for a month only but i ended up staying for three months, that's how good this place was. As for the work, it's pretty straightforward which is just talking with the students about pretty much anything. Some students require you to pay extra attention as they're just beginners and you have to choose your words carefully for them to be able to understand you, which isn't really a problem because you'll get the hang of it pretty easily. Busan is an amazing place as well. If you're into hiking, there are so many places that you can visit (Jangsan is a must) on your spare time with the students and the other volunteers. The cafe is located next to the Busan National University, which makes it a pretty lively and a nice place. I left the cafe yesterday and i already miss it. You won't regret signing up for this place folks. People I met there are nice and amazing. Korean students here are willing to share their life and culture, even to show you around Busan. I live in a big house with around 10 to 12 people. I enjoyed spending time with my roommates and coworkers. We played around the PNU area or travelled in the city while we had free time. We work 4 hours a day… read more for 6 days a week. At the beginning, it's a little hard for me to talk for such a long time. But after few days, I found the fun of working. In sum, It was a great month for me.in Busan. This is a bit late, but better late than never! I had an awesome two weeks working here last December. Due to an unforeseen change in plans beforehand, I had to find somewhere to work at the last minute, and Andy was kind enough to take me on rather quickly. Working at the cafe, though it sometimes felt long since we stayed with the same member… read more for hour-long shifts, wasn't difficult since all we have to do is talk! Many of the members are open-minded and friendly, as are all of the volunteers, and even though I wasn't there for long some of us grew close quickly. I also had such a great time living in "big house," one of the apartments there - all of my housemates were amazing company! The area this is located in, right next to Busan National University, is one of the centers of Busan, and there's never a shortage of things to do. Thank you so much for everything! I hope to visit again one day (: 감사합니다!! Oliv is outgoing and very fun :) He likes people and willing to talk and share ideas with them. He has many talents. He is really good at cooking. He is also a cleaning master. He is active and has such a good energy that can influence positively on people and community around him. Hey Andy!! !here's a little feedback for your language café!! The place… read more where you'll be sleeping is comfy and you can make yourself at home! !The work is not to hard (although 2 days off would've been better...!) and there are many things to do in Busan!! Maybe i'll come back one of these days!! Word of advice: Keep the place as clean as possible!! !and make it as lively as possible too!!! Volunteering at the cafe was one of the highlights for this year. I really loved it - both the korean students, the other volunteers and, of course, Andy and Brian organizing this venture. This was a truly awesome workway experience! During my 6 week stay I have met a bunch of great people, chatted about so many interesting things, got to know Korean culture and felt incredibly happy! Andy and Brian were amazing, they made me feel welcome from the very first day. When it comes to needing to fix a broken phone, helping with a… read more ticket reservation or simply having a drink together - Andy is your guy. He is incredibly helpful, kind and fun! It was truly an honour to meet you! Want to meet some super duper extra cool people and have a great time?! Feel interested in cultural exchange? Wish to make Korean friends? Yeah? Then think no more! Join this Language Studio and have the time of your life!!! Andy is such a wonderful and friendly host who welcomed me into this cafe community with wide open arms. My 2 months here at the cafe was such an extraordinary experience. This is my first workaway experience so I didn't really know what to expect, but I'm so happy that I chose to be here at this language cafe. I made so many kind and energetic… read more friends from all walks of life from around the world. From 4 hours of talking with various Koreans for 6 days a week, I learned so much about the Korean culture and society. Surprisingly, I also learned a lot about myself along the way. I enjoyed my time in Busan so much and made so many memories. I would love to come back here again in the future. I really recommend volunteering here. Andy is a great considerate and generous host. He even cooked delicious Korean food for us sometimes. The apartment was so comfortable except for the low pressure shower...kk, aside from that, everything was great. I loved my share mates, The job was easy, only 4 hours a day talking to Korean people and it was a great opportunity for me to learn… read more about Korean culture. I really enjoyed spending time with the volunteers. I never thought I could stay up all night as if I was in my early twenties again. This 3 weeks was so special for me. I really recommend this place. Thank you so much Andy, I hope to come back again. 고맙습니다! Steven helped our cafe a lot. He is an adventurer who loves nature, animals, and wild life. He was willing to share his travel stories and experiences. That was really suitable for our community aiming exchanging different kinds of cultures and ideas. He is very fun and easygoing. He doesn't mind doing anywork needed. I was here at this awesome place for 3 weeks this November. After I stranded in Busan, Andy offered me full of kindness and love a place in his cafe. The work was… read more easy and the guests in the cafe were not only the most lovely and amazing people I have met in a long time, many of them became even part of our small family. Through all the long talks I became a very rare and deep view into the korean lifestyle and society and this is something normal traveler will probably never experience. This was an amazing workaway! It was the first one I did and the experience could not have been any better. Andy is really great and very helpful, the area was great for food and the work was really enjoyable - you get to meet lots of people (local & international!). I stayed for one month and would definitely come back (and hope to!) I recommend… read more this 100% if you have the chance. I had been so happy while I was working with Alisa and Kate. They helped me a lot in our cafe. 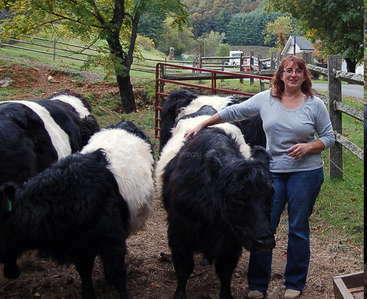 They are very friendly and sociable. I was always comfortable with them. I am so grateful that Josefine joined our community to volunteer. She is a great volunteer! All I can say about her are only good Things. I wish Josefine come back our cafe to visit or volunteer in the near future. Take care and have safe travels, Josefine! I had a really great time here and I wish I had stayed longer! Andy was always available to help with anything I needed and was so kind and flexible with my schedule when I had trips planned. It was really a pleasure to volunteer, and the schedule of 4 hours each working day passed so quickly that I had plenty of time to enjoy being in Korea and… read more to do my own thing! In fact the volunteering felt like fun more than work; I met some lovely people during my stay (the Korean students all had an excellent attitude and made me feel so welcome). 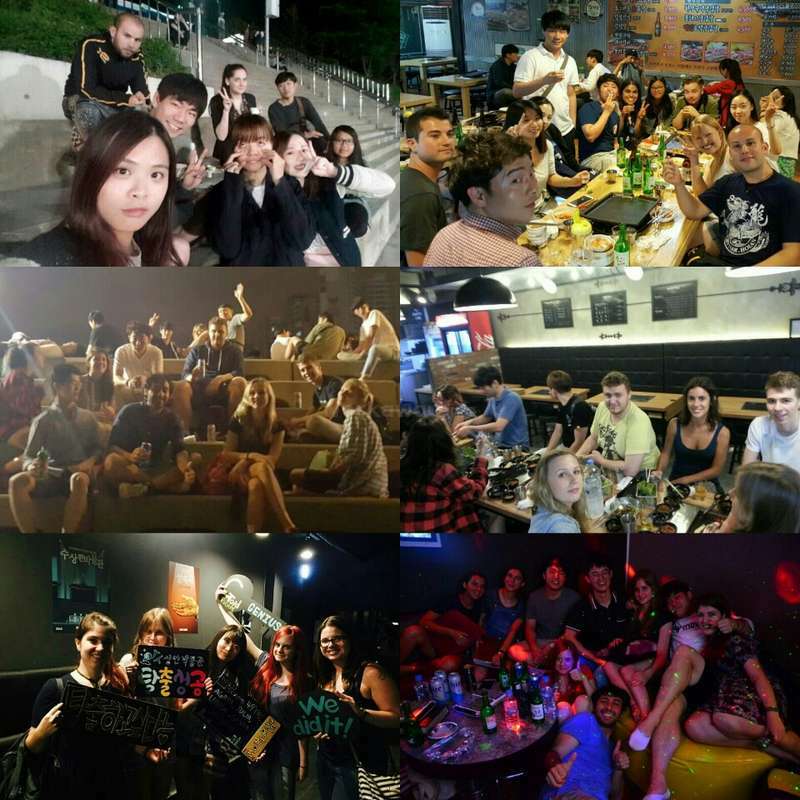 In particular the social life in Korea is excellent, it was hard to stay in any evening, as someone was always going for dinner/drinks/jimjebong on the weekends..etc. Really I would recommend volunteering here to anyone - you will be well looked after and have a great time. Andy, this project is incredible! You're such a wonderful host who really took care of all of us and let us help your people. Wow, you're amazing. Really. During my stay in Busan I learned so much doing what i love the most: teaching languages. I realized with you how wrong I was in Tourism. This is the best thing to do, I had the happiest days in… read more my life in Busan with you all guys. Miss you and thank you once again for all your attentions. I stayed at the cafe for 4 weeks. It's been a great experience for me. I've met amazing people and made friends with them. Everyone is friendly. I had great opportunities to meet local friends as well. They would show me around Busan, and show me Korean culture. Andy is the kindest Korean man, he is a good friend and a great host. I truly enjoyed… read more my stay in Busan. Hope the best to the Language Studio and the volunteers. It was really plreasure having Daniel and Silvia volunteer with us. They were very suitable volunteers for our cafe. They are always friendly and enthusiastic. They are willing to introduce their country and share their cultures. They like to talk and hang out with Korean friends and students also love speaking with them. Both Daniel and Silvia… read more had an exellent attitude and were an asset to our cafe. They were also deligent to enjoy Busan and I really liked it. When they have free time, they tried to travel many parts in Busan and other places in Korea. I really enjoyed opportunity to stay with Andy. I think this job is unique because we had chance to interact with locals and learn a lot about their culture. We went to eat out almost everyday what was very nice because they gave us a lot of advice what to eat. Also, the other volunteers we were working with were very friendly and outgoing. I… read more enjoyed the time spent there and I would definitely consider staying here again if I have a chance in the future. Kristina is an easy-going, active, outgoing, and delightful person. Everytime I talk with her, it was so fun and pleasant. She likes exeercisinf and she loves pets. I really enjoyed outdoor exercising and cat cafe with Kristina. :) I feel sorry about cleaning. I wanted volunteers clean the house by themselves because it is their own space.… read more Sometimes it worked well and sometimes it didn't work depending on who live there. As to Kristina's suggestioin, we started a weekly regular cleaning all together. It works very well and everyone is satisfied now. I should have begun that cleaning plan earlier. I stayed 3 weeks in the cafe and this was my 1st workaway! :) i enjoyed my time and will miss dearly Andy, my colleagues and the city of Busan. Look no further, this is THE BEST workaway in South Korea! Andy and Brian are two lovely guys who will make sure your stay is as comfortable and as memorable as possible! The language studio is new, modern and very fast growing! So many beautiful people, so well organized, so creative.... I could go on! I am extremely grateful for the… read more opportunity to work there! Don't miss your chance, fellow traveller! If you are looking for a workaway which allows you to really plunge into the local culture, this is the right one. The work at the cafè is a rich experience both for the "students" and the volunteers, who can share their thoughts and practice their language skills in a comfortable and familiar atmosphere chatting together. It was my first… read more workaway experience and my only regret is that I didn't try it before. I felt really at home and both Andy and Brian were always willing to help at any moment. You can have plenty of time for other activities too, and in the evenings you can join the cafè group which often enjoy the dinners and after dinners together. 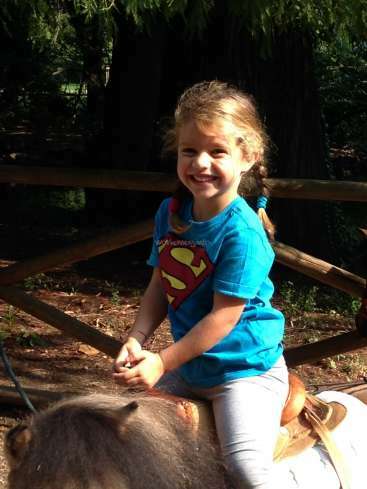 At the weekends extra activities such as short trips are usually provided too. It was very hard to let her leave. She helped me a lot in our cafe. She is delightful, fun, possitive and also smart. I was always happy to work with her. This was my first Workaway experience and it did not disappoint. I was there for about 3 and a half weeks and the "work" consisted of talking with the local Korean people who want to practice their English skills. In the process I got to learn a lot about Korean culture and make some friends with the students and other volunteers. Korean people… read more are some of the friendliest I've met anywhere in world, and the volunteers come from all over and are really fun to get to know. Busan is a very beautiful and fun city to travel to and I'd almost always have people to explore with or show me around or go to events. I think the best part about the whole thing was making friends with the Koreans and hanging out with them after the cafe or on weekends. The housing situation could have been more organized with cleaning responsibilities, but it wasn't bad. I definitely recommend and I'd do it again. Dima is very friendly and pleasant. He is an adventurer who is open-minded and willing to try anything new. He is possitive and doesn't mind doing and experiencing a variety of works. Andy is a very nice and caring person, that will welcome you with open arms. The work although getting a bit repetitive after more than one month, was very nice gave me the opportunity to meet and spend time with many nice local people. Usually after work a small flock of people gather and go out to a restaurant, karaoke or whatever seems to… read more promise fun. The volunteers are an interesting and diverse group of people that from around the world. Busan is a beautiful city, with many things to do. The housing although a bit crowded, the sub optimal air conditioning and questionable bathroom, was fairly comfortable. Internet was fast and reliable. Overall a very pleasant experience, would recommend to anyone that wants to get a look at modern Korean life. I stayed here for about three weeks and it was really great! Andy is a really nice guy and the people at the cafe I met there are really great too - I made a lot of good friends within a short time. The work also doesn't really feel like work and the hours are short so it leaves lots of time to explore the area! Michaela was perfect in our cafe. She is a very friendly and lovely girl. Also her drawing is amazing. I was always grateful to her for her help and contribution. Rene was a great workawayer in our cafe. I was very comfortable with him in our cafe and also house. He is a gentleman who is friendly and kind. He is also very smart. It was very lucky to meet her. She is friendly, kind, energetic, and full of fun. She is the best workawayer ever. I just left you guys! :( I am happy to be on the road again but missing you all ! Perfect volunteers experience for traveler! Well..actually....It was my first experience with workaway and i couldn't ask anything more. Everything was perfect. The cafe', the students and Andy is a super great host! Is always friendly and kind, and he really take care about all the volunteers. 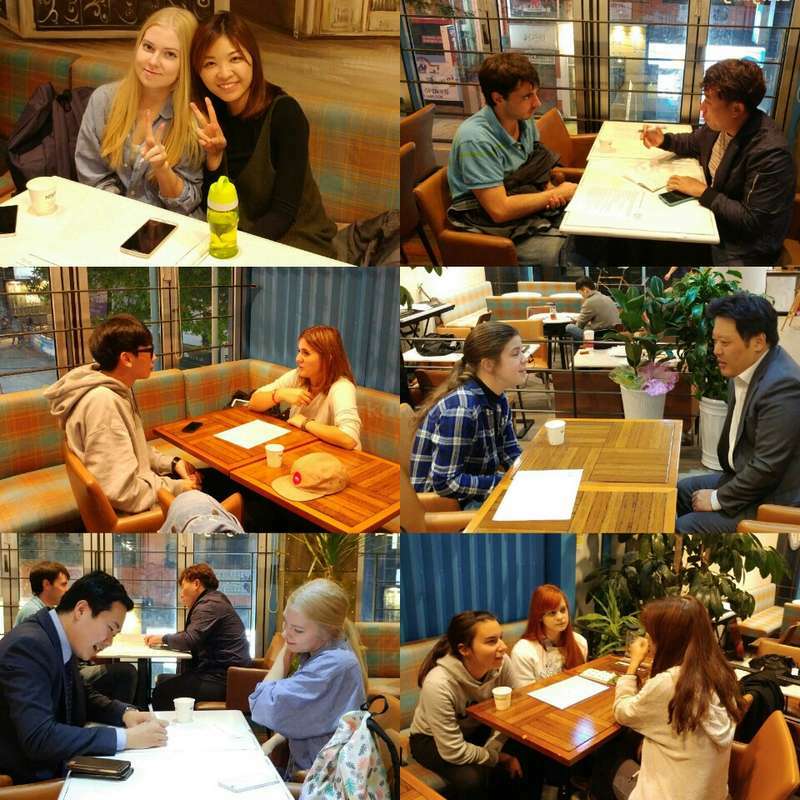 The korean students in the cafe' are all nice and open to exchange different point of views about… read more life, culture, foods and many others aspects. I really recommend Andy and the job in the cafe'. The apartment is also located in a vibrant university area, one of the best in Busan in my opinion, you could hang out every nights if you want to. Good Job my friend ! And remember always get 3 points!! I spent one month at the cafe and have nothing but good things to say. Andy was an awesome host. He is very easy-going, friendly and helpful. The atmosphere at the cafe was very casual and it was a great way to meet some local people and learn about Korea. Andy, the students and other volunteers were all very welcoming and the atmosphere at the… read more cafe and apartment were both great. I highly recommend this experience! I'm so happy that you started this project! On of the best places to stay in vibrant Busan. You gonna love it! Talking with new people, hanging out together, have a latenigt dinner - everything and much more you will experience in your new small home! And of course having Andy as a host - there's no better option :D see you soon!! Andy is a really nice guy and he'll definitely take care of you. In my opinion a language café is the best way to meet and make really good friends with locals and other travelers at the same time. To me the "work" doesn't really feel like work and besides that you have plenty of time to explore the… read more city/country. Jonas is a cheerful, delightful, and humorous man. He is open-minded and willing to experience new things and different cultures. He also has full of positive energy! He likes dancing, watching DVD, and eating Lamyeon (noodle). All people who spended time with him just love him. I learned many strange Korean sentences and phrases from him and it was always fun to use them on unsuspecting Koreans! When I come back to Korea I'll definitely go to Busan and eat some Lamyeon with… read more you Andy! Andy, my dear oppaya. You know you made my time in Busan special. We should give you a superhost badge in addition to the "Trust me, I'm Korean" t-shirt that we never had the time to get for you. Also, save a bed for me for next winter. Andy is probably one of the best hosts you can find in Korea! Andy is a living legend! Very genuine guy and also very kind. At once a friend, and then a brother. Busan is a great city and he was always happy to show the volunteers around the area and take us out to eat some of the local delicacies! (ask him about NAK-JI 낙지) You'll enjoy your time here for sure. Andy's one of the best! One of best volunteers I ever met. Friendly, gentle, kind and warm-hearted. Always feel comfortable and pleasant with him.